RxSpotlight for Windows is a powerful hybrid drawing editor and raster to vector converter. You can edit, update clean up your raster images, scanned maps, drawings, sketches and other graphics, and convert it into vector data. 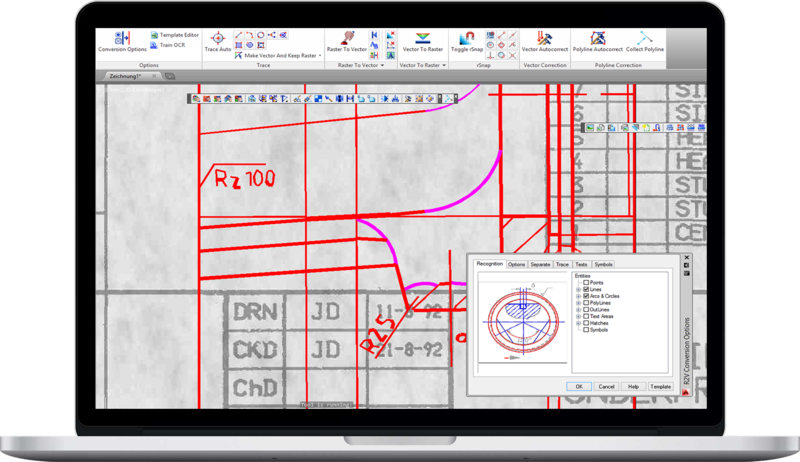 Raster Object Selection enables you to select raster lines, arcs, and circles using tools similar to those for vector selection. Now, this technology has been improved even more. A raster object selected by any object method now has “grips”, which allows you to modify its configuration. It has a set of modifiable properties similar to those of vector objects – line style, width, etc. Prior to the latest version of RxSpotlight, only vector objects had such properties. Now the program treats raster and vector graphics in the same way. With RxSpotlight, you can create a workspace as an integrated file containing both raster and vector objects. In the new version, the workspace is unlimited; a raster image of any size can always be inserted into the current workspace. All RxSpotlight objects have a Z-value (Elevation) and sequence order. 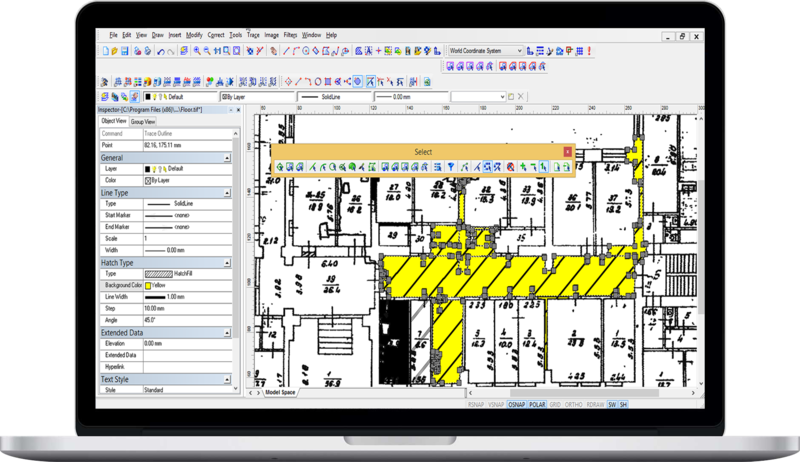 The capability of saving a RxSpotlight workspace to the .DWG format preserves this data. RxSpotlight uses a modern multi-document (MDI) interface that allows you to work with several workspaces simultaneously. Crop color and grayscale raster images, change their resolution and scale, deskew them, and eliminate linear and nonlinear deformations using the calibration procedure. Change brightness, contrast, hue, and saturation. Adjust the color gamut of an image using a histogram, improve image quality, or apply a set of color filters. Draw and create raster objects, and merge monochrome raster images with color ones. The new versions now include functions like tracing (semi-automatic interactive raster-to-vector conversion) color and grayscale images. In addition to simple graphic object tracing the new version, you can now trace raster shapes that correspond to vector templates. You just need to select a raster shape, and the program will try to recognize it and match it to an appropriate vector object. A significant enhancement to the polyline tracing is the new auto-detection of direction at intersections. If you have not chosen a direction during a specified waiting interval, the program will continue tracing in the automatically defined direction by itself. Improved algorithms for automatic raster-to-vector conversion allow converting scanned drawings to CAD-files one by one or in a batch mode, even overnight. The improved conversion options allow precise tuning to achieve the most accurate vector representation of source files. The resulting drawings consist of lines, polylines, arcs, circles, texts, and shapes. Line styles, widths, text height, hatch styles are preserved. RxSpotlight now provides automatic conversion of raster shapes to specified vector samples. Built-in OCR recognizes text strings on the drawings. RxSpotlight for Windows has a comprehensive set of tuning tools for autocorrection of vectors obtained after raster-to-vector conversion, specialized functions for editing vectors – for example, merging a group of vectors to the object of a given type (some segments to an arc or circle), cropping, extension, etc. One very powerful tool is Vector Object Search and Replace, which works on vectors (i.e. CAD-files). For example, it is possible to find and replace with standard symbols all fasteners on a mechanical drawing or all windows and doors on a floor plan, etc. View a full list of features and compare the difference versions of RxSpotlight: Edit & Pro. 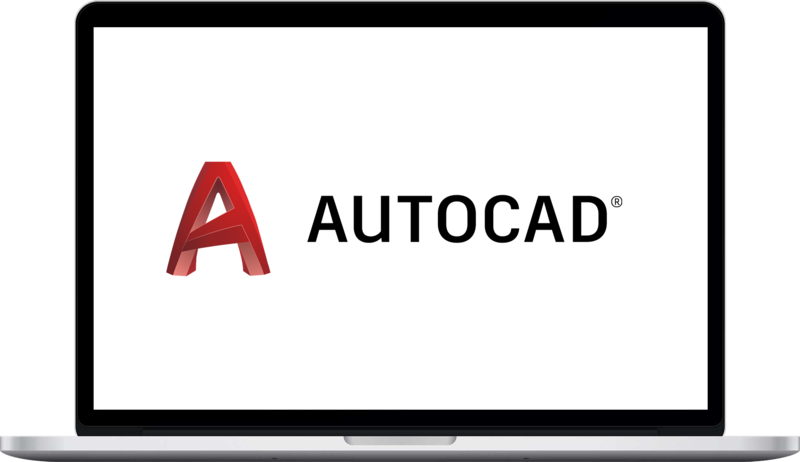 Combine the power of AutoCAD with intelligent raster editing, raster-to-vector and vector-to-raster conversions - directly inside AutoCAD. The last three AutoCAD versions are supported at any time, which reduces the cost of implementation of hybrid technology. Fill in the form to get instant access to download a free demo of RxSpotlight. This is a demo only and if you want the full test or purchase you can contact our sales-team at sales@rasterex.com.